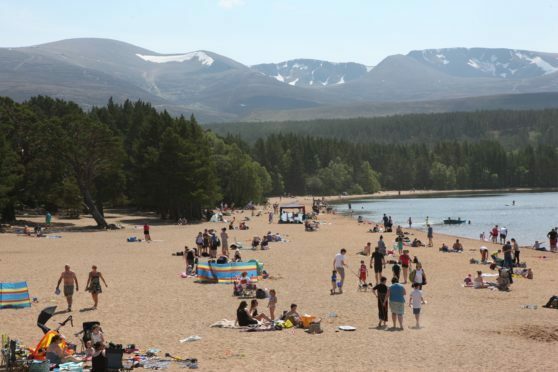 The beach at Loch Morlich near Aviemore, which was one of the hottest places in Scotland in May. Parts of the north basked in sweltering temperatures which exceeded those of Barcelona, the French Riviera and Crete yesterday. The mercury soared to a boiling 26C along the west coast, while Aviemore sizzled at 24C and Aboyne reached a peak temperature of 23C. Scores of people made the most of the bank holiday by surrounding the picturesque banks of Loch Morlich, near Aviemore. Children splashed in the loch’s crystal clear water and paddled across the surface in boats and dinghies, while their parents soaked up some sunshine on the sand. Hundreds of people visited the open air swimming pool at Stonehaven to relax during the afternoon. One mum, who was enjoying the day with her children, said: “It’s great to see so many people enjoying the open air pool. The temperature reached 22C at Kinloss but was 18C along the Moray coast at Lossiemouth, where a cooling breeze drifted across the town. There will be haar creeping inland from the North Sea today, causing a colder morning, but the sky is expected to clear by the afternoon. The weather will take a turn for the worse later in the week with thunder and rain forecast for tomorrow. However, summery conditions are expected to return by the weekend. A Met Office spokesman confirmed that Ayrshire was the hottest part of the country yesterday, but added that areas in the north and north-east were not far behind. He said: “The further west you went, the warmer it got.